In Aristeia! 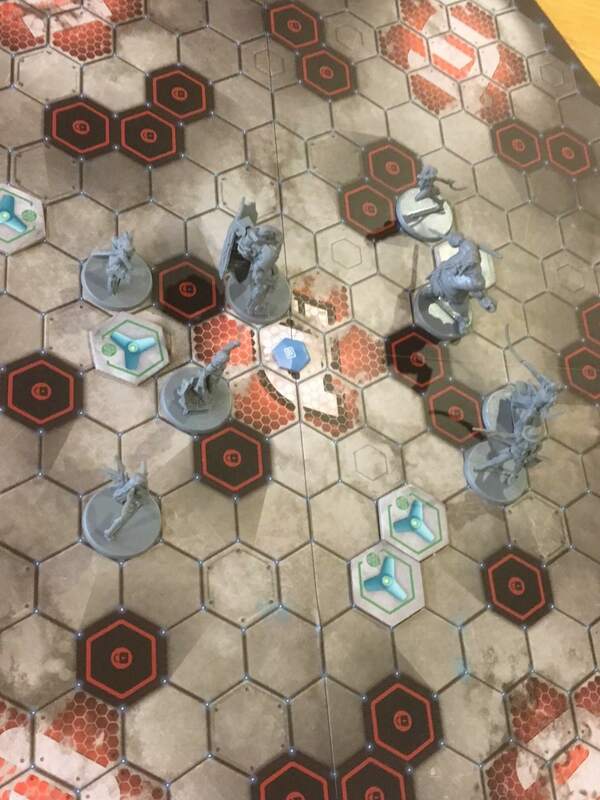 two teams of four combatants do battle in a futuristic arena known as The Hexadome. To do this, two teams are first chosen from the available collection of eight characters (a whole season of expansions is planned) based on either the present configuration shown in our picture, or as the result of a draft or similar. A scenario is then chosen – either to capture and hold the marked locations on the board, rack up a certain number of kills or basically any other victory condition you can imagine within the boundaries of the game. Achieving the chosen objectives involves a relatively complex and feature rich dance between the on board characters, each of whom has a highly individual set of abilities, strengths and weaknesses. 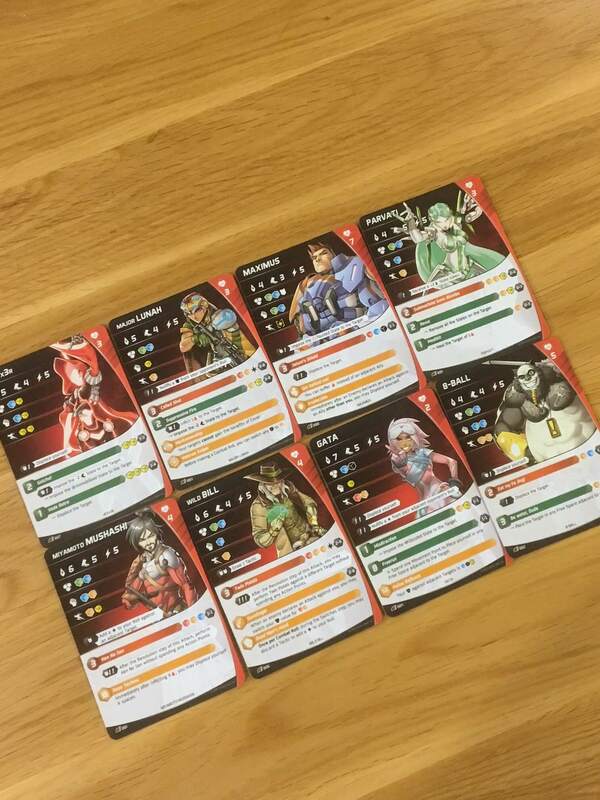 Players also hold a hand of tactic cards made up of both character specific and generic options, which adds a light element of deck building to the proceedings, as well as a number of ways in which normal play can be interrupted or affected. Ultimately, the team that can achieve the requirements of the chosen scenario first (or is nearest when the agreed turn limit is reached) will win. Everything in Aristeia! is produced to a very high standard, but what is perhaps most impressive about it is the quality of the lore that surrounds it. The game comes with three booklets, the first of which is simply a richly detailed and beautifully drawn selection of backstories for the eight base characters, plus a load of additional background information. Then there is a detailed, traditional rulebook and a smaller, punchier reference guide. Whilst on the small side, the tokens are all well made but entirely functional, although the rulebook isn’t altogether clear about where and when to use them at first. That’s not the only thing it is a bit unclear on and whilst it does feature some great examples and a number of call out boxes that guide the players through their first game, it doesn’t explain the nuances of certain gameplay features in as straightforward a way as it might. That said, it’s far from bad overall, so consider this gripe a minor one. 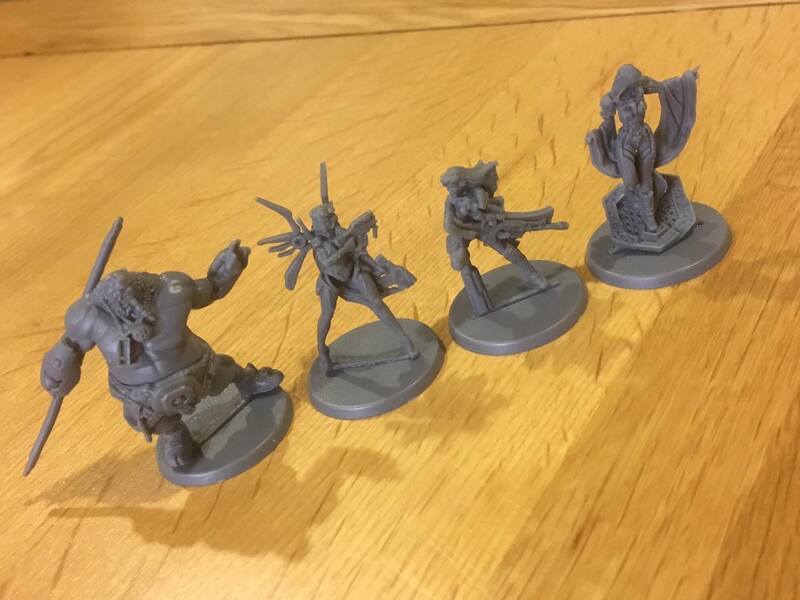 More importantly, the single cast miniatures are of a particularly high standard and in my case at least, there were no manufacturing flaws or imperfections to call out. The cards are just as good – if not better – and offer the same, anime style artwork that runs throughout the box art and all the booklets. Every character is as individual in design as they are in gameplay terms, although it would be remiss of me not to state that the whole cast resembles that of a certain video game (Overwatch) in overall makeup. The game includes a large set of exceptionally weighty custom dice that I really liked and the board and player cards that slot into them are fantastic as well. 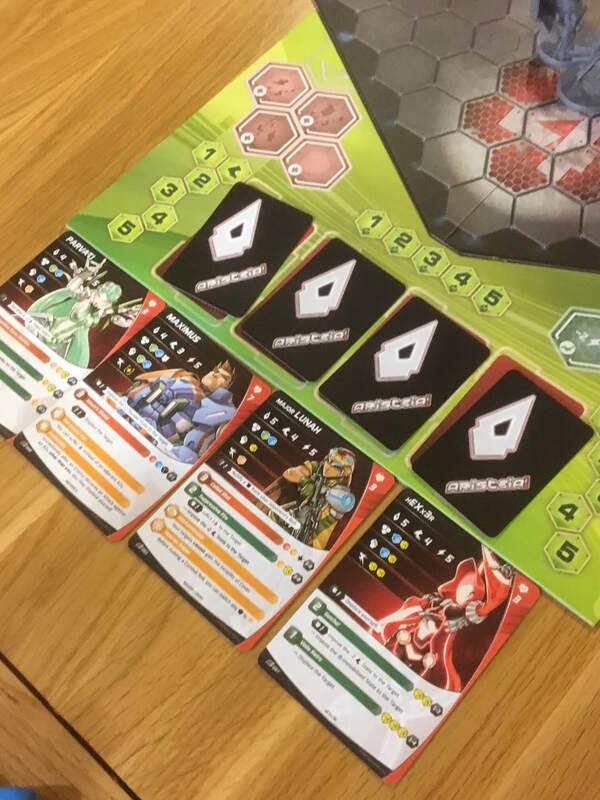 Each turn is effectively made up of four rounds, during each of which the players will flip one of their face down character cards and compare initiatives. Whoever has the faster character acts first for that round and has the opportunity to move and take actions up to the value of the energy statistic for their active character. Usually, this means moving once or twice and then taking an action – sometimes two. 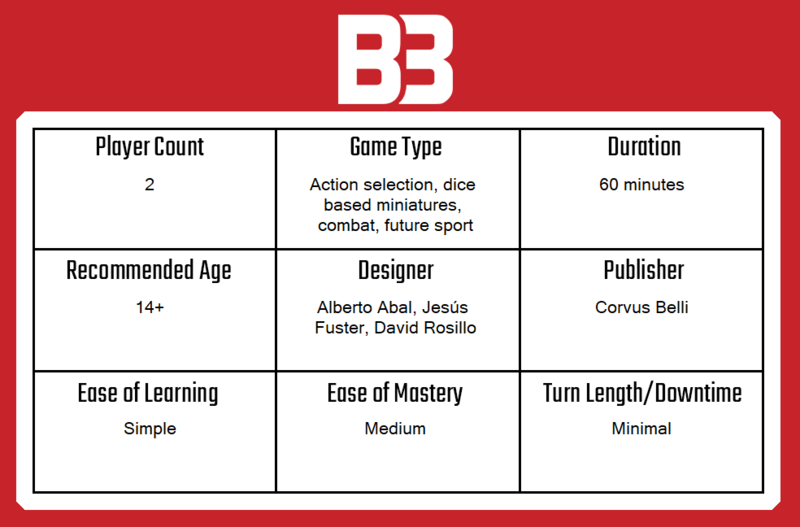 Often, actions have both a “core” mechanic and what the game calls a Switch mechanic, with the latter offering variant ways to deal with situations depending on the outcome of a dice roll. Deciding in what order your team will act happens at the beginning of the turn before seeing what your opponent will do (rather than one character at a time), which requires more and more planning consideration as the game continues on. The location of characters and scoring positions has to be considered, as does attack range and current health. Single turn kills are relatively common in Aristeia!, especially when a powerful ranged character like Major Lunah is able to fire freely, or a strong melee character like Musashi gets close to a weaker one. Should a character be killed, he or she will find themselves in the infirmary for a round of turns and then on the bench for the next, so they’ll effectively miss two full rounds of play. Play continues to alternate between teams, one character at a time, until all four characters have acted. At this point, there’s a brief cleanup phase which may include card management, resetting objectives and so on, before play restarts using the same structure as before. Aristeia! is a game of small decisions with big consequences, so what begins as a relatively simple game to pick up and play soon begins to reveal a lot of tactical depth and mechanical nuance. Choosing when to place your characters in the turn order is critical, for example, but so is second guessing your opponent. Think you have an advantage in a combat between two characters? Who will act first? Would it be better to have one of your other characters intervene, or even better, will your opponent retreat into a dangerous position that another character can take advantage of? It’s a difficult choice anyway, but as the players learn more about Aristeia!, the choices only get harder. Similarly, what to do with turns presents interesting choices. Most characters have three or four skills plus their switch abilities and only limited energy to achieve them. These choices are all affected by the objective – if that happens to be focused on reaching scoring locations and holding them for a turn, then it’s important to consider who among your team (and the opposing team) could do so this turn and taking advantage of that if you can. The Switch mechanic basically acts as a “lesser” action, should your dice roll fail to produce the outcome you want, but it also introduces an aspect of thinking on the fly. Didn’t roll enough hits to kill your opponent? Perhaps you could use the Switch mechanic to give them a negative modifier to movement to stop them from scoring. One weird aspect of combat (that I don’t like) makes all combat two way, so whenever you attack an enemy, they will fire back. This can mean that melee fighters are able to return fire at any range, for example, even against a character at extreme range like Major Lunah. These factors all combine to create the feeling of a really tight, squad based shooting game, with the added tactical complexities of various objectives. 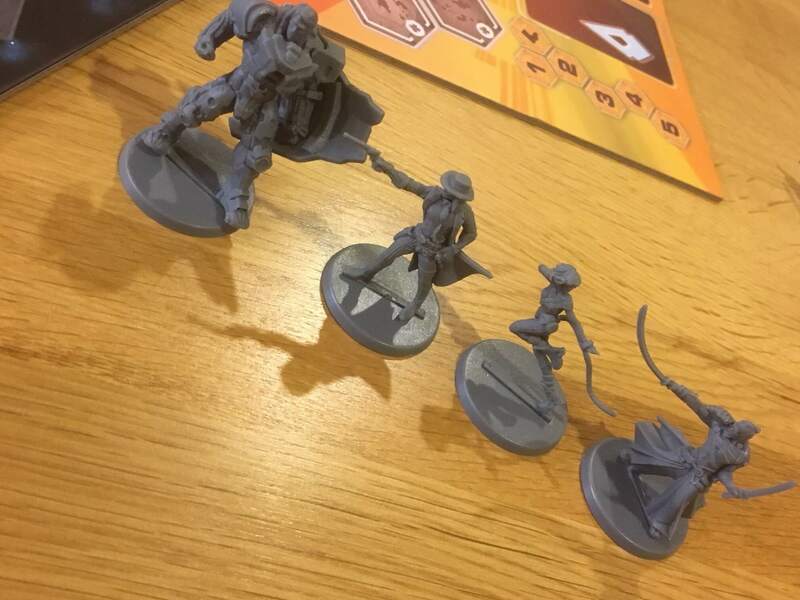 The characters are mechanically diverse and ambitious in comparison to the traditional board game tropes, meaning that play also feels very different to the norm. Hexxer, for example, can displace herself and her allies, whilst Gata, sprints around the Hexadome free-running over characters and other obstacles with ease. The whole game is as fast, fluid and free flowing as it sounds. Ultimately, if Aristeia! is attempting to position itself as an exciting and persistent new entry into the long-neglected future sports/arena combat genre, then I think it has accomplished its mission with distinction. Between the interesting lore (backed by exceptional written and physical components) and the fantastic mechanics that blend simple deck building, dice rolling and action point usage, Aristeia! delivers a fantastic out of the box experience that is certain to expand in the future as new teams/characters are introduced. It’s quite rare for board games to emulate video games successfully. I was impressed by the pace that DOOM: The Board Game set when I reviewed it last year, but I think Aristeia! might even do it better because it doesn’t have the same, cumbersome need for a “Dungeon Master” player. The Switch mechanic is a great way to introduce a method of reducing the feeling of bad luck from dice rolls, as is the inclusion of a deck of action cards. When combined, these make Aristeia! feel like a miniatures combat game without any of the usual limitations. Add those mechanical features to a game with multiple ways to win (via variable objectives) and a lot of setup and team flexibility, and you have a real long term winner on your hands. You can find out more information on Aristeia!, including any stores which carry stock of the game, on the game’s official website.